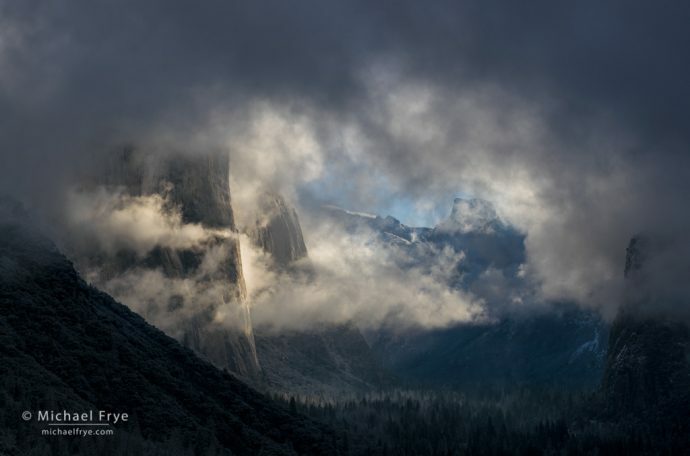 Storms have been rare in Yosemite during this dry winter. But on Monday evening a small, cold weather system moved down the coast and brushed the area. I set my alarm for 4:00 a.m. Tuesday morning to check on the weather and see if it might be worth driving up to Yosemite Valley. We had about three inches of fresh snow at our house in Mariposa, but Yosemite hadn’t received much precipitation – less than a tenth of an inch. Most of the rain and snow with this system fell further west. 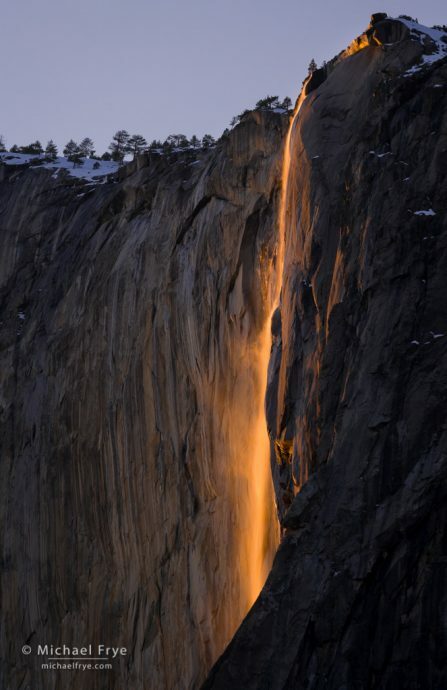 Horsetail Fall at sunset, Yosemite. I had this view to myself When I made this image near Northside Drive back in 1995. How things have changed! – From February 12th through 26th there will be a special “event zone” between Yosemite Valley Lodge and the El Capitan crossover. – During that time Southside Drive will be open to two-way traffic, with no parking allowed between the El Cap crossover and Sentinel Bridge. Horsetail Fall season will be here soon. The best light occurs from around February 16th through February 23rd. 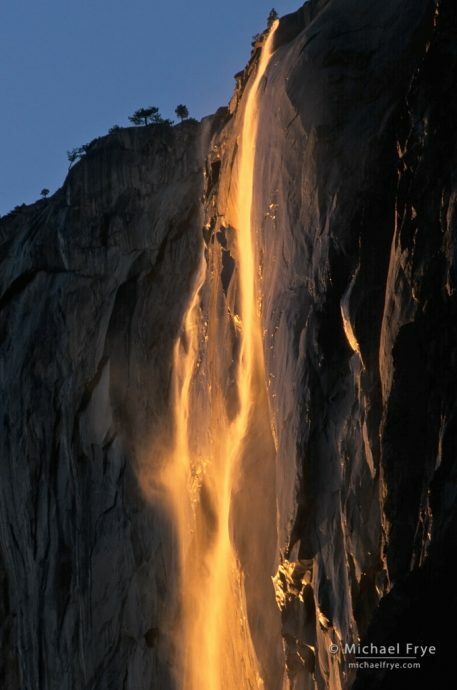 During that time, if conditions are right, the waterfall is backlit by the setting sun, while the cliff behind it is in the shade, creating dramatic color and contrast. 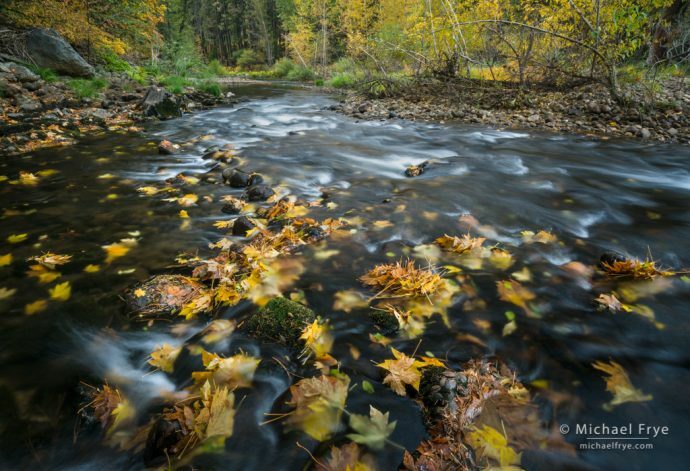 Big-leaf maple leaves along the Merced River, autumn, Yosemite. 19mm, 2 seconds at f/16, ISO 100, polarizer. Claudia and I spent Friday in Yosemite Valley checking out the fall color. And it was beautiful. The big-leaf maples, in particular, were quite colorful. It was a clear, sunny day, so there wasn’t any weather to add drama to the valley landscapes. 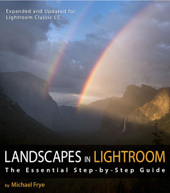 When the weather and light aren’t that interesting I tend to narrow my focus and photograph smaller subjects. And for those subjects, conditions were perfect. The low autumn sunlight kept some parts of the valley in shade virtually all day, and that soft light was perfect for highlighting the autumn color. Plus, from the south side of the Merced River you could look toward sunlit cliffs on the north side of the valley and find beautiful, golden reflections in the shaded water. We just finished our workshop on the eastern side of the Sierra. When I arrived a few days before the workshop the aspen color was rather mixed, with bare trees, green trees, and every stage in between. But the weather was cold, and things turned quickly. 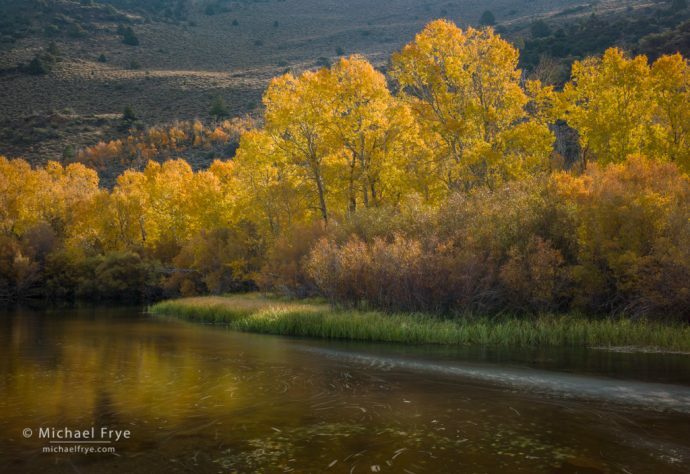 By the time our workshop started most of the green leaves had turned yellow and orange, and we found lots of beautiful color – particularly along the June Lake Loop. This past winter’s record-setting snowpack in the Yosemite high country has left tons of snow and ice lingering into July. Tioga Pass finally opened on June 29th, and Claudia and I headed over the pass on July 3rd to scout for our Range of Light workshop. 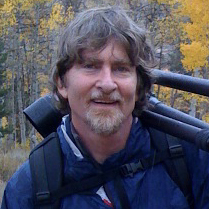 We found little snow below 9,000 feet, but above that altitude the hiking was tough, requiring either long detours to avoid snow, or traversing tedious, slippery, sun-cupped snowfields. That meant we couldn’t get to certain locations during the workshop, but as compensation we got to photograph roaring creeks and rivers, and partially-frozen lakes. 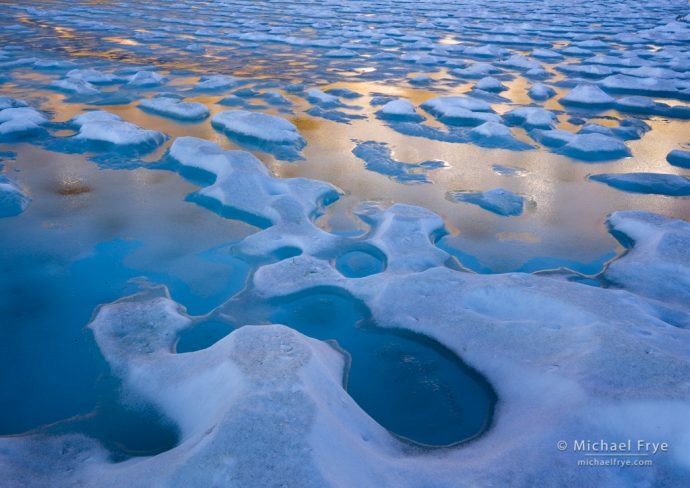 When frozen lakes melt you can often find beautiful patterns where ice and snow mix with patches of open water. On the last evening of the workshop we went to Saddlebag Lake, which had some amazing ice patterns. Better yet, the ice went into the shade around 6:30 p.m., while the rusty-colored mountainside on the opposite side of the lake stayed in the sun for another hour, casting beautiful gold and orange reflections in the water. This was kid-in-candy-store stuff to someone who likes abstracts as much as I do.